3herosoft DVD Audio Ripper for Mac is the best Mac DVD Audio Ripper and DVD Audio Extractor which can rip DVD to the most popular audio formats. 3herosoft DVD Audio Ripper for Mac can convert DVD audios to MP3, MP2, M4A, WAV, WMA, AAC, AC3, OGG, RA formats and extract DVD audio and rip it for playback on iPod, iPod nano, iPod shuffle, Zune, PSP, iPhone, iRiver, Archos, Creative, etc and mobile phones. 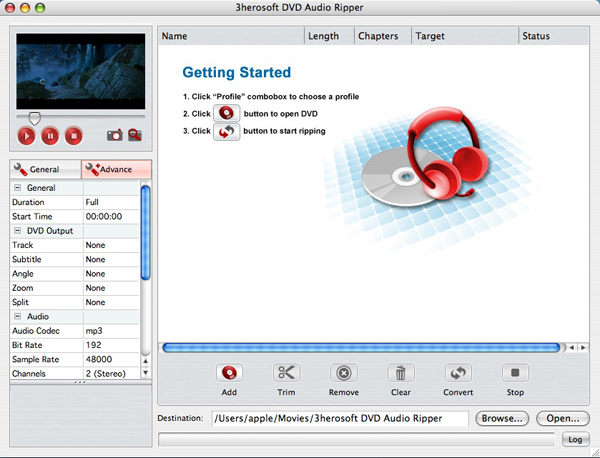 3herosoft DVD Audio Ripper for Mac has strong function of editing options, such as movie trimming, video and audio encoder settings, batch conversion and so on. Free Download 3herosoft DVD Audio Ripper for Mac to have a wonderful experience now! Qweas is providing links to 3herosoft DVD Audio Ripper for Mac 3.5.5.0509 as a courtesy, and makes no representations regarding 3herosoft DVD Audio Ripper for Mac or any other applications or any information related thereto. Any questions, complaints or claims regarding this application 3herosoft DVD Audio Ripper for Mac 3.5.5.0509 must be directed to the appropriate software vendor. You may click the publisher link of 3herosoft DVD Audio Ripper for Mac on the top of this page to get more details about the vendor.